The teeth of Colorado schoolchildren got much healthier in the past five years, but significant needs remain in cavity treatment by income and racial measures, according to an updated long-term survey. Fourteen percent of Colorado third-graders had untreated decay in the 2011-12 school year, down from 25 percent five years earlier, according to the oral-health survey by the Colorado Department of Public Health and Environment. Nearly half of third-graders are now getting tooth sealants that block decay, at 45 percent compared with 37 percent five years ago, the survey said. 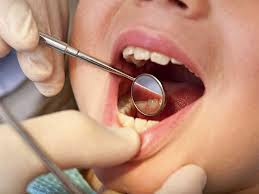 Publicity and outreach efforts to parents have boosted the number of children using dental benefits under Medicaid, said Dr. Katya Mauritson, oral-health director at state health. More kids are enrolled in dental "homes" that will monitor their care over time. Yet many low-income and Latino children either lack dental benefits or aren't using those they have. Children at lower-income kindergartens had more than twice the rates of decay or fillings as children at better-off schools, measured by qualifying for reduced-price meals. For the whole story, please go to The Denver Post.